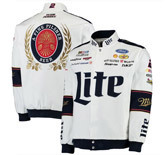 Brad Keselowski #2 Miller Lite / NASCAR Uniform Jacket, by JH Design. Brad Keselowski brushed cotton twill adult uniform jacket with embroidered sponsor graphics, satin lining and snap-button closure. 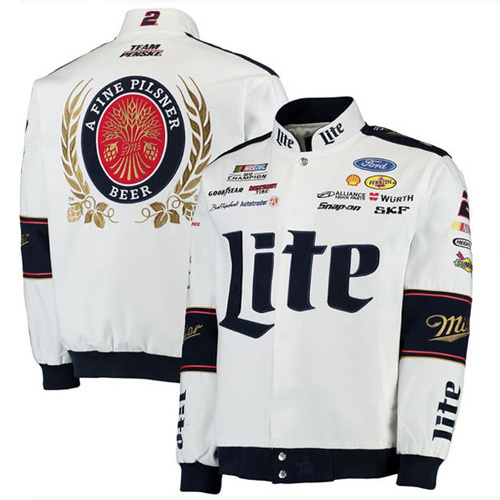 The Miller Lite uniform jacket encompasses the same look as the driver's firesuit, featuring a crew neck collar and rib-knit cuffs. JH Jacket sizes run slightly larger than average.